President Barack Obama must be trying to throw a fix in college basketball to help the Big Ten and the University of Illinois. It has to be a fix. Either that or is he just a deranged basketball fan going over the top. 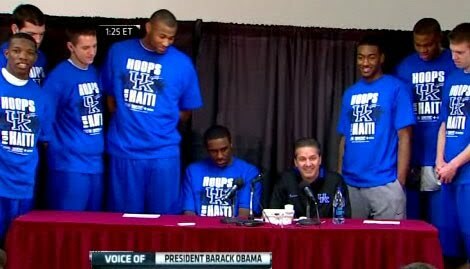 First, he calls the University of Kentucky basketball team to thank them for their work for Haiti. Lots of other, lesser known groups have done remarkable work for Haiti, but he did not call them for a media opportunity. After all, they weren't undefeated and the number one team in the country. So what happens? The Wildcats go out and lose to South Carolina by a score of 68-62, causing the delirious Gamecock student body to storm the court, celebrating the school's first ever won over a top-ranked team. Now South Carolina has to reportedly pay a $25,000 "stimulus" fine to the Southeastern Conference because, heaven forbid, they acted like college students. Editor's Note: ESPN's Andy Katz had originally tweeted earlier today that the fine was only going to be $5,000. He corrected himself a few hours ago. And now, to top it all off, he has scheduled the State of the Union Address for tonight at 8:00 PM ET. That is right smack dab in the middle of the Georgia - Florida basketball game. It means that WSB 750 AM in Atlanta (the flagship station for the Georgia Bulldog) has to leave the game at 8:00 PM for the speech (they are a news radio station). The game coverage will then have to switch to 97.1 The River. Lucky this is just basketball, because if he had pulled this stunt during the Georgia - Florida football game he might have lost a lot of Georgia votes in his next election. Oh wait, he lost Georgia the last time. So please Mr. President, leave the Southeastern Conference alone. Let the Illini try to make the dance on their own merits! And once last suggestion for SEC Commissioner Mike Slive: donate the fine to a worthy group providing on the ground relief in Haiti.